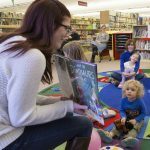 Did you recently notice a few extra little children and stuffed animals in the Library? Did a disco ball catch your eye when you were trying to study? It’s no surprise! 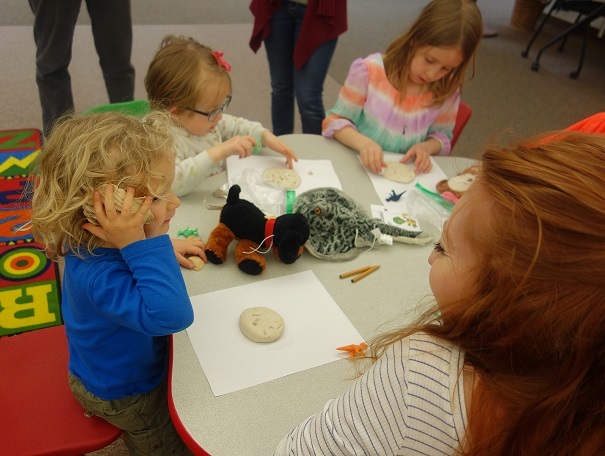 Twenty-five children from ages 2 to 9 years visited Andersen Library on Friday, April 6, 2018, to participate in the library’s Sixth Annual Stuffed Animal Sleepover. 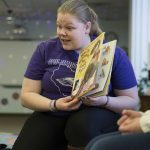 The children of UW-Whitewater students, staff, faculty, and the Children’s Center, were invited to participate in dance party fun followed by a story time. 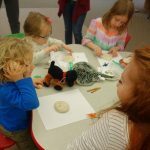 Art Education student Emily Wozniak coordinated a craft activity with the assistance of student Library staff members Kayleigh, Katherine, and Gianna, during which children created a fossil using clay. 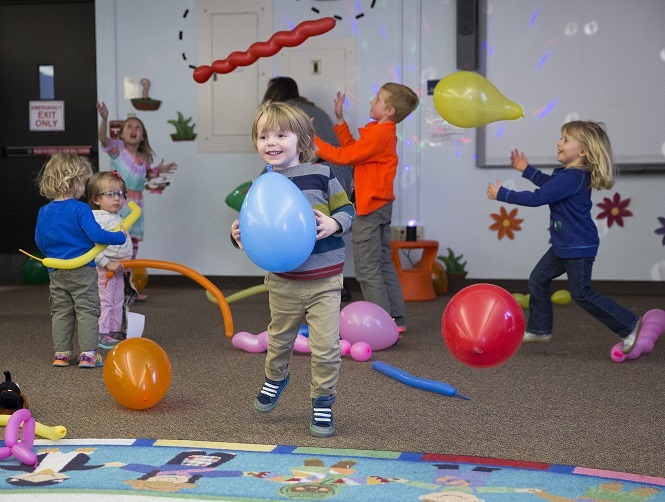 The children then joined in dancing with Rockin’ DJ Ben who got them moving with toe-tapping We Are the Dinosaurs by Laurie Berkner, They Might Be Giants’ I am a Paleontologist,and more. Ready for a rest, the children then enjoyed stories and action rhymes with UW-W Elementary Education students, Lexie and Samantha, who read book selections for the older children, including What the Dinosaurs Did at School, Groovy Joe Ice Cream & Dinosaurs, and finally, How do Dinosaurs Say Good Night.Librarian Diana Shull led the toddler storytime with Dinosaur Roar, Dinosaur Dance!, Never Touch a Dinosaur, and Dinosaur vs. Bedtime. Before heading home, the children put their stuffed animals down to nap. Do you think they stayed put once their owners left for the night? Not a chance! 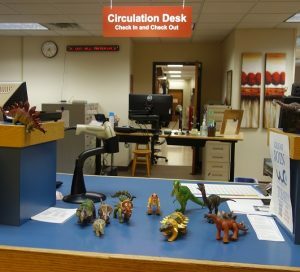 The stuffed animals stayed up all night and managed some mischief with the Library’s resident dinosaurs after hours. 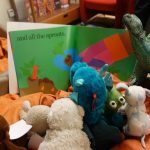 Event volunteers created story booklets featuring photos of the children’s stuffed animals’ nighttime antics which the children kept as mementos. 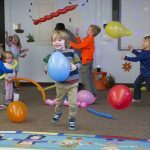 A big thank you to everyone who helped make the event fun for all! We are grateful for the many student workers and staff members involved behind the scenes, from blowing up balloons to setting up (Jordan, Sarell, Brenda, Beth, Macaela and Emily C.) to staying in the evening to take wildlife photography and put together photo books (Deronica and Barb, and ECE student Callie). They didn’t know that only Library staff are allowed behind the Circulation Desk. This entry was posted in around the library, education and tagged story time, storytime, Stuffed Animal Sleepover. Bookmark the permalink.